Cochin: Tenzin Gyatso, or the XIV Dalai Lama, is called 'Kundun', meaning the 'presence' by those close to him. This implies what this festival, which includes a photo exhibition and screening of films, seeks to attain. It is more than a gesture of solidarity with a people who have been severed from their roots. The 'Ocean of Wisdom', the four-day exhibition of 20 rare photographs of the XIV Dalai Lama and screening of films on and about Tibet will open on April 17 in Kochi. The festival is being organised by the Friends of Tibet (India) and Kashi Art CafÃ©. The Friends of Tibet was formed in 1999 at Bombay, with just one member. Now it has more than three thousand. Only 20-25 of them are from this city. This exhibition and film screening are part of efforts to announce the presence of the Cochin chapter of the movement, says Sethu Das, founder and president of Friends of Tibet (India). 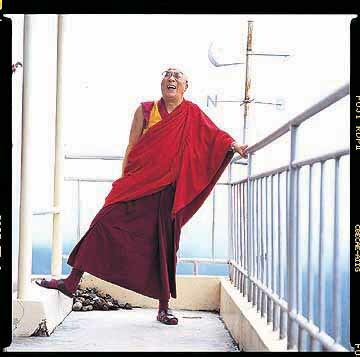 The photographs by Suresh Natarajan capture the Dalai Lama in different moods. And the films will throw open the different dimensions of exile, physical and psychological. 'The Cup', a feature film by Jamyang Khyentse Rinpoche, a juxtaposition of monastic life with modern life, it is about the impact of the 1999 World Cup football tournament on a Tibetan monastery near Dharamsala. While 'Kundun', by Martin Scorcese, tracks the life of the present Dalai Lama, the documentary 'Escape from Tibet' is about a group of young Tibetans' escape to India. The former is a documentation of a nation breaking up and the latter is about the reality after the Chinese invasion of Tibet. Also there is, 'Tibet: Cry of the Snow lion', a documentary by Tom Peosay made over ten years. It traces life in its varied manifestations, inside monasteries, among warriors, in brothels and slums of holy city of Lhasa to the snow-clad Himalayan peaks. "These are the main films to be screened. We have more films on this subject with us. If the audience is interested, we can have continuous screenings in the day time also," adds Mr. Das. The concept is to garner as many supporters for this movement. Incidentally, 'Ocean of Wisdom' will travel to Thiruvananthapuram, Thrissur and Kozhikode and to all State capitals. But then, this is just a beginning. The Friend of Tibet and its members are busy, planning for bigger assignments in near future. For the time being, they are trying to make the message heard, loud and clear.